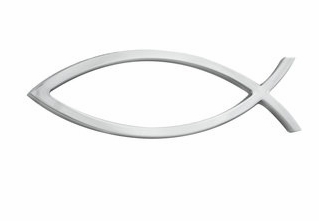 If you like a little more discrete look to your Christian fish emblem on your vehicle, this small size is the one to get. The fish is a sign that Christians have used to identify themselves to one another throughout history. Durable plastic fish emblems are the perfect witnessing tool on your automobile. Glossy fade-resistant shiny foil finish. Fish emblem is 2 1/2" x 1" and attaches to any flat surface with adhesive. In the past, I purchased this type of product in a store. But since I have always had such great customer service and quality products from Support Store, I decided to order these as well. Thanks for the great job!! Best UsesTo place on the back of your car, trunk or bumper.